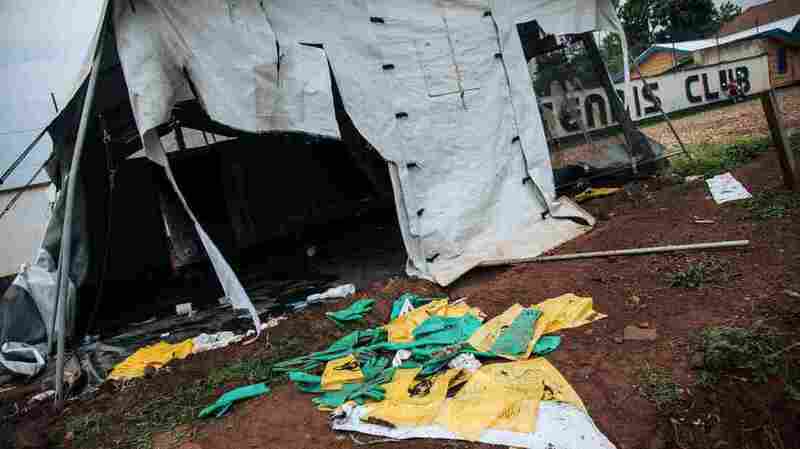 Protective equipment for Ebola care is left on the ground next to ransacked tents by demonstrators at the Ebola transit centre in Beni, following a demonstration last week against the postponement of elections in the territory of the Beni and the city of Butembo. An American health care worker who was providing treatment to patients in the Democratic Republic of Congo is being monitored at a Nebraska health care facility after possible exposure to the deadly Ebola virus, hospital officials said. The University of Nebraska Medical Center in Omaha confirmed Saturday that the unidentified person was being monitored in a secure facility not accessible to the public or other patients. The person is not sick nor showing any Ebola symptoms, but could be monitored for up to two weeks, officials said. The Democratic Republic of Congo is experiencing one of the deadliest Ebola outbreaks in history. Since August, the Democratic Republic of the Congo health ministry says there have been at least 593 confirmed or suspected cases of Ebola and at least 360 people have died. The World Health Organization says an unstable security situation and protests over election delays are hampering health care workers’ efforts to administer vaccinations and treating patients. The Ebola outbreak in northeastern Congo has been particularly difficult to contain because it is an active war zone. The Ebola virus is not contagious if a person is not showing symptoms, which include fever, severe headache, fatigue, diarrhea and unexplained bleeding, according to the Centers for Disease Control and Prevention. Nebraska Medicine officials said the individual in their care is not an official patient, and therefore, the hospital will not provide any updates on the person’s status unless it deems necessary. If the individual develops symptoms of the virus, the person will be admitted to the hospital’s biocontainment unit, one of the few in the U.S. dedicated to treating highly infectious diseases, Taylor Wilson, a spokesperson for Nebraska Medicine said. The Nebraska Medical Center treated three patients with Ebola in 2014. In 2015, several others were monitored after exposure, but none of them developed the disease.